A total weight-loss strategy helps trim your thighs and stomach. Dropping 20 pounds can make a major difference in your body size, overall health and even your self-confidence. The good news is that most women lose stomach fat first; the not-so-good news is that thigh fat is usually more stubborn. No matter what you do, however, your body will ultimately decide where to burn fat. It isn't possible to target specific areas for weight loss, although you can tone muscles to create a firmer appearance. Eat 500 fewer calories than you burn each day to lose about 1 pound per week, or 20 pounds in about five months. As a guideline, Harvard Medical School recommends that moderately active people multiply their weight times the number 15 to estimate calorie usage. 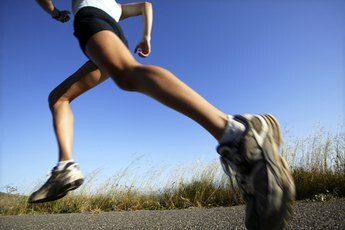 So at 145 pounds, the typical woman burns about 2,175 calories per day if she exercises. Get 30 to 60 minutes of cardio most days of the week to help the 20 pounds come off for good. Cardio may also be your best defense against visceral fat accumulation deep in the stomach, according to Kerry Stewart of Johns Hopkins School of Medicine. Walking briskly is fine, but jogging, swimming laps or performing other vigorous cardio exercises will lead to even faster weight loss. Sculpt mini-skirt-worthy thighs with squats. Stand with your arms stretched in front of you, and slowly bend at the knees and waist until your thighs parallel the floor. Pause for one or two seconds, then lift back up by pushing your heels into the ground. Perform 10 repetitions and repeat for a total of three sets. Tone your stomach with the bicycle maneuver, which the American Council on Exercise deems the best ab-toning exercise of all. Lie on the floor with your hands behind your head, and lift your legs until your knees are at 45-degree angles. Now move your legs as though you are pedaling on a bike; as your left knee nears your upper body, meet it with your right elbow, and do the same with your right knee and left elbow. Continue for 10 repetitions, rest and repeat for a total of three sets. For balance and overall toning, perform strength training for all muscle groups twice weekly. Use dumbbells or weight machines, or simply use your body weight for exercises like pushups and planks. Perform one to four sets of eight to 12 reps for each exercise. To help fight visceral belly fat, Harvard Medical School recommends getting between six and eight hours of sleep per night. Consult your physician before starting a weight-loss program. Women need to eat at least 1,200 calories per day for proper nutrition. Let muscles recover for at least 48 hours between strength-training workouts. Can Recumbent Bikes Firm the Stomach? Does Strength Training Burn Fat and Shrink Your Body's Skin? 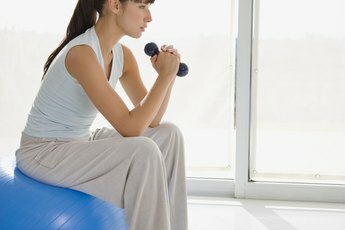 Do Situps Make Your Waist Smaller?